PPBC is proud to introduce a “NEW” Blues Band to the Pikes Peak area. THE CLEVELAND EXPERIMENT is PPBC’s second “find” of the season. 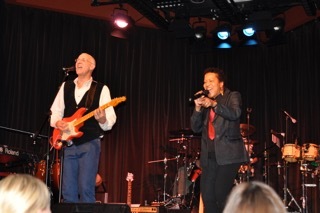 The leaders of the band; Sandi Cleveland and John Stoesser are newcomers to Colorado Springs. As with many “new-to-the-area” musicians, they attended a local blues jam, where they immediately caught the attention of the Pikes Peak Blues Community. With their “funky” style of Blues, Classic Soul and R&B, Sandi Cleveland/vocals; John Stoesser/guitar and vocals; Danny Walgreen/drums, and Tony Blanchard /bass will satisfy blues lovers on the big, beautiful Stargazers stage. 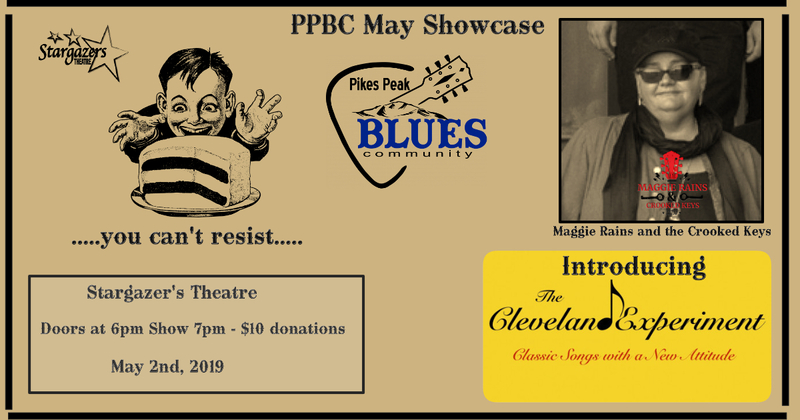 The headliner for PPBC’s May Showcase at Stargazers is MAGGIE RAINS & CROOKED KEYS! They wowed the crowd at PPBC’s IBC competition last August at Stargazers. Tracy J. Reynolds, also known as Maggie Rains, is the lead singer of this high-energy, seven piece, Blues Rock band. Maggie is an accomplished vocalist with a powerful, soulful, voice and abundant energy. Maggie Rains & Crooked Keys have built quite a following that continues to grow for this Colorado native and her Crooked Keys. Come out and welcome them once again to Stargazers.